Dairy products are considered to be a foundation of health for many cultures. Milk has been used by humans since the beginning time to provide both fresh and storable nutritious foods. It is considered that consuming dairy products provides health benefits - especially improved bone health. Foods in the dairy products group provide nutrients that are vital for health and maintenance of your body. These nutrients include calcium, potassium, vitamin D, and protein. Intake of dairy products is linked to improved bone health, and may reduce the risk of osteoporosis. The intake of dairy products is especially important to bone health during childhood and adolescence, when bone mass is being built. Milk and dairy foods are healthy foods and considered nutrient-rich because they serve as good sources of calcium and vitamin D as well as protein and other essential nutrients. They provide phosphorus, potassium, magnesium, and vitamins A, B12, and riboflavin1. Intake of dairy products is also associated with a reduced risk of cardiovascular disease and type 2 diabetes, and with lower blood pressure in adults. Here, at Export Portal, we are specialized in all the kinds of dairy trade. We offer you a broad range of dairy products, such as milk and yoghurt drinks, cheese, butter and milk powder and take care of the import and export of all dairy products all over the world. As you know, raw milk is the basis for a tasty assortment of products, from butter to yogurt and cheese, created over the centuries by necessity, accident or ingenuity. Many of these products are nearly as old as milk itself, but guess who's one of the most recent inventions of humanity that is produced from milk? Believe it or not, it's famous, loved-by-all ice cream! The records about ice cream obsession didn't appear in the historical record until the 17th century. Apparently, it was only because it was difficult to cultivate such powerful freezing devices as we have now, necessary for producing and storing of ice cream. Makes it another point to be glad to live in this century, does it not? As an expert in food products export and import, we offer a wide choice of dairy products for sale, such as cream, buttermilk, Powdered milk / milk powder, produced by removing the water from milk, Skim milk, Condensed milk (milk which has been concentrated by evaporation, with sugar added for reduced process time and longer life in an opened can), Khoa (milk which has been completely concentrated by evaporation), Kefir (fermented milk drink from the Northern Caucasus), Smetana (Central and Eastern European variety of sour cream), Clotted cream (thick, spoonable cream made by heating milk), Creme frache (slightly fermented cream), Single cream, double cream and whipping cream, Kumis/Airag (slightly fermented mares' milk popular in Central Asia), Ghee (clarified butter, by gentle heating of butter and removal of the solid matter), Smen (a fermented, clarified butter used in Moroccan cooking), Anhydrous milkfat (clarified butter). 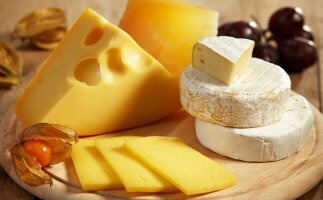 We also supply world famous product that is popular in all countries - Cheese! Hard Cheeses, Semi-Hard Cheeses, Semi-Soft Cheeses and Soft Cheeses - we've got them all! Our supplies of cottage cheese, Cream cheese, Asiago cheese, Anejo Enchilado cheese, Blue cheese, Cotija cheese, Gruyere cheese, Parmesan, Romano cheese, Gouda from Holland, Raclette from France, Cheddar cheese are always fresh and provided by the international and local cheese manufacturers. Because we always have your best interests in mind, Export Portal covers a wide range of milk products, like sterilized milk, flavoured milk and yoghurt drinks. Yogurt, Clabber (milk naturally fermented to a yogurt-like state), Gelato (slowly frozen milk and water), Ice cream, Ice milk - the low-fat version of ice cream and other varieties of milk products from all the world! With us shopping gets easier!